Microwave Accessorizes With Built-In Toaster | OhGizmo! By Evan Ackerman on 04/24/08 • Leave a comment! We demand a lot from our kitchens these days, and appliances are starting to feel the heat (heh) and lose their cool (heh) and… um… sink. And why should we settle for boring old unitaskers when we can buy things like this toastowave? 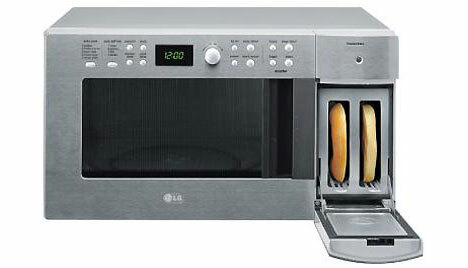 LG’s LTM9000 (9000 being the best version of anything) pumps 900 watts into the microwave and 800 watts into the toaster, and offers 9 toasting levels “to suit all of your needs.” It comes in “high-tech stainless steel,” white, or black, and costs $140, which is probably way more expensive than buying a microwave and toaster and duct taping them together. But at least it would help me get one step closer to my ultimate dream: having every appliance in my home capable of making toast. I’m looking at you, blender.